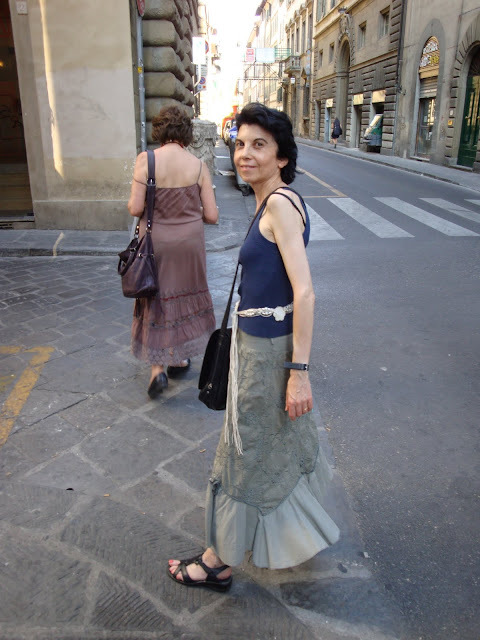 Today I would love to give a shout out to my beautiful wife Michèle, who back when we visited Firenze a few years ago, bought this wonderful long skirt at a small shop there. Sometimes I do miss Firenze; it is such a beautiful city! Note: This is my last post for the month of June, as my wife and I prepare for our yearly summer vacation in France. I'll be there from 04 July to 23 August. I plan to do some more street fashion photos while I'm there. Until next time, take care everyone! great blog!! I'll follow you, I also love Firenze, I lived there for a while and it's my favorite spot in the world, have fun in France!! Hola ! soy triana, y te quería pedir un pequeño favor. solamente necesito que entres, cuando lo hagas, automáticamente te dirá, "tu voto ha sido transferido" o algo así. En serio, muchísimas gracias, y un blog estupendo por cierto.